Kay and Tom Patterson are teaching Hand Engraving in the Jewelry Studio this week. 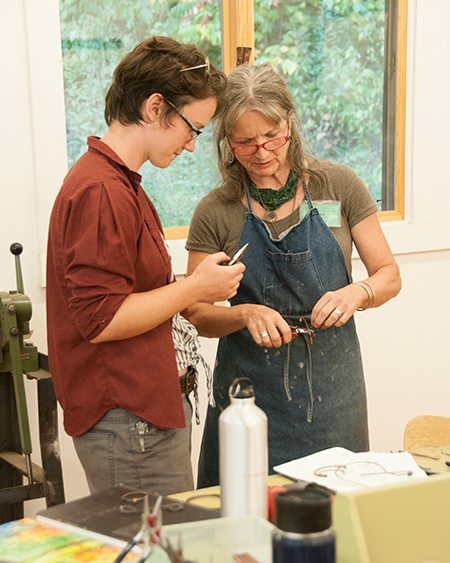 You can find Kay teaching many times throughout the year at the Folk School in a variety of subjects including Jewelry, Metalwork, Felt Making, Enameling, and Shoe Making. She also supports the school’s Enameling and Hot/Warm Glass programs as Studio Assistant. I sat down with Kay to learn a little bit more about her life, inspirations, and her crafts. Enjoy our interview! 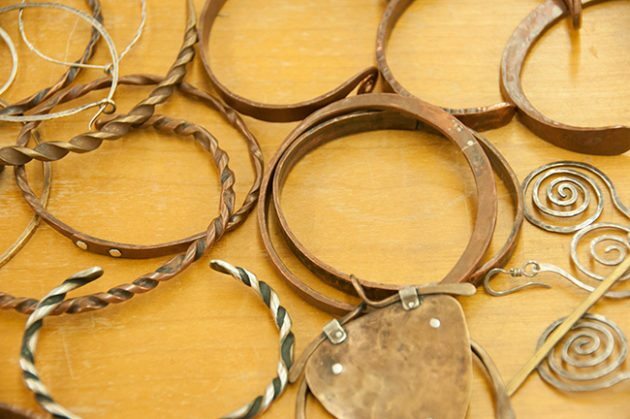 CP: How did you first become involved with the Folk School? KP: Tom and I had moved here in 1992 from southern Oregon and didn’t even know about the Folk School at the time. 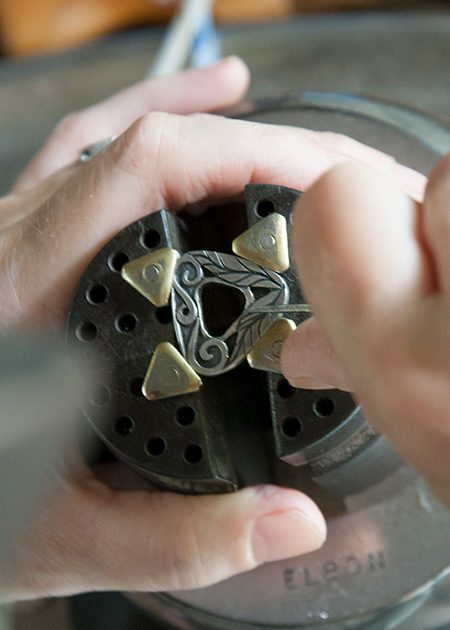 At the time, Tom was working as a hand engraver for a signet ring company. That allowed use to live anywhere we wanted to because his work was all by mail. I was working for a florist when I got word that the Folk School wanted someone to answer the phone on the weekends (this was before the era of cell phones). When I worked one Saturday overnight, I stayed Keith House and the dance was happening. I met people in the community and would watch the dancing, and that was the first thing that got me curious about the Folk School. I was interested in both craft and music. A variety of recycled jewelry pieces made out of copper and recycled materials (L-R: Pin by Kay; hair pin made by Leah Dolgoy, a student’s pin in progress). We met Chuck and Peggy Patrick soon after finding out about the Folk School and we had a lot in common with them: lifestyle, homesteading work like tanning skins, so we really connected with them. The Folk School was great to find out about. CP: When did you start teaching at the Folk School? KP: I started taking classes before teaching. I learned how to felt and enamel at the Folk School. The first class I ever took was a fiddle class with Andrea Hoag. Next, I took a doll class with Dee Dee Triplett. I also started doing Fall Festival around 1995 or 1996. Back then, the Mountain Life area was by the Vegetable Garden where the log cabins are located. We’d set up there with other folks interested in the old mountain crafts, people like the Patricks and Jerry King. In those days, I had buckskins, 18th-century clothing, and jewelry. Tom started teach at the Folk School first. Barbara Joiner met him through the Patricks and she wanted him to teach engraving, but he taught scrimshaw first. I learned to felt from a Work/Study Summer Schulz (who went on to co-found the Driftless Folk School) and got really into that. Martha Owen (the Folk School’s Resident Artist in Spinning, Knitting, Dyeing and Feltmaking) asked me to teach felting at the Yarn Circle and that evolved into teaching at the Folk School. Students are busy making hats and scarves in Kay’s felting class in the Wet Room Studio. 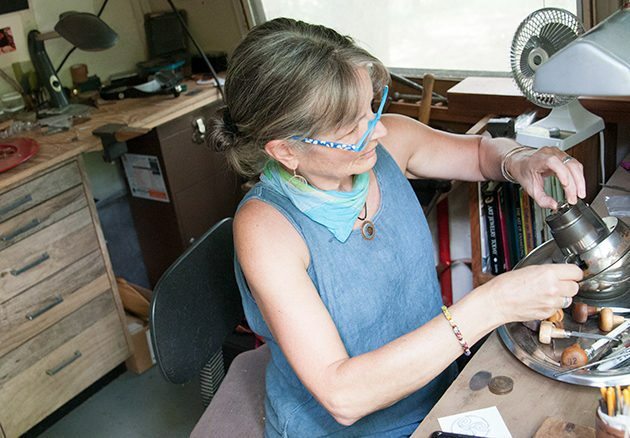 Kay works on an engraving project in her home studio. CP: I counted in the catalog this year and I think you teach at the Folk School more than anyone else and that doesn’t even count the people you assist. You teach in so many different subject areas too: Enameling, Felt Making, Jewelry, Metalwork, Shoe Making. How did you get involved in so many different crafts? Do you feel like you have a main craft you focus on, or does that change? KP: It does change. You can’t get really great at something being spread too thin. When I became involved in felting, it really became a passion for a while, especially making hats. I found I could make money making hats, so that was my main deal for years. I eventually grew tired of that having to produce so much, so now I am shifting back to jewelry. In most of our classes we work in copper because that’s a good (and less expensive) metal to learn on, but silver is most saleable. I’ve been working more in engraving in silver and also enamel. KP: Enamel is powdered glass. It can come in lots of different forms: paint (like watercolor), crayon, but mostly in the studio we are using powder that you sift over copper. Once you have you design laid out, you put the piece in the kiln, or you torch it. In the kiln, it’s about a two minute firing and you can fire multiple times on a piece. 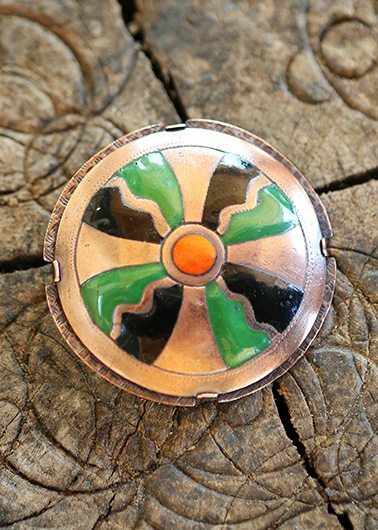 Enameling is basically putting colored glass on copper. I’ve been specializing in brooches recently. CP: I’ve noticed that Enameling classes have some fancy-sounding French words to describe techniques. Specifically, I’ve always wondered what these techniques are all about: Cloisonné, Basse-taille, and Champlevé? Can you give us the lowdown? KP: All the terms in enameling are in French because the French are the most famous for enameling (along with the Russians). Cloisonné is when you use thin wires to separate the cells on your metal and fill each cell with different colors. Cloisonné can be translated from French into English to mean “cells” or the action of partitioning. Basse-taille is when you have a textured surface on your metal and you cover it with one or two coats of colored transparent enamel so you can see down into it. In my class, we also engrave the metal background. You can put a layer of ink to bring out the texture before you cover it with transparent enamel. Champlevé is where you have cells, but they are deeper and you wet pack your enamel into the space. In copper, you usually do opaque enamel because the copper metal interacts the opaque. CP: How are homesteading and craft related? 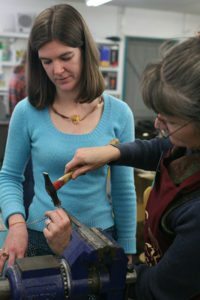 Kay shows Anna how to work with metal to create beautiful jewelry pieces. KP: A big part of it has to do with the desire to make a living without having a job where you go work for someone else. It’s about having a life at home that you really love and being master of your own time. Teaching is like taking a break and getting to go out in the world and share your skills. Homesteading is also about being resourceful and self-reliant. When I was tanning skins, that was very related to homesteading, because that’s making leather out of the skin people are hunting. That’s how it began for me. Our neighbors were big elk hunters, so I took their discarded skins and tanned them. I have two mohair goats and I thought I might use their hair for felting, but their fiber would be much better for spinning. I tried spinning and I’m not a great spinner. It takes a lot of sitting down and I don’t like to sit down that much. Being able to have you own time is the most important part of a homesteading lifestyle. Living the simple way we do is also the result of not wanting to have a big mortgage or be in debt. We wanted to own our life. Craft works well for that because you can stay at home, make things, and go out and sell them or teach them. CP: Do you think your work is more functional than decorative? KP: I like functional better. If I can make something that works, that is much more appealing. That’s why I like those fibulae as opposed to pins. The fibulae actually hold clothing together and have a purpose. Making clothing has always appealed to me. I wear many felted garments that I have created. Kay’s students make felted hats and shoes in her felting classes in the Wet Room. CP: Who or what are some of your inspirations? KP: Tom has been a big influence on my metalwork. Some other metal people would be D.X. Ross (who we named the Jewelry Studio after) and Barbara Joiner. For enameling, Marilyn Druin & Jackie Spencer. For felting, I love the work of Sharon Costello. Also, I’m fond of Scandinavian and German felters who make the heavy duty functional things. I often look back to history to see what people wore. I love Medieval times with the big hoods and cloaks. I love northern winter clothing even though we live here in the south and it is not that usable. CP: Do you have any rituals or practices? KP: Not exactly. Because I teach so often, having an upcoming class gives me focus on that subject. In between class preparation and teaching, I do what I want to around the home. I love to have the free time to get my garden in shape, work on the grounds, gather firewood, etc. Kay working in her home Airstream studio. CP: Recycling seems to be a big focus in your classes. KP: Yes, and in our life too. It’s good for the earth. Mining metals is terrible for the environment and so is enameling. At our house, our structures were built using recycled material that Tom gathered. We usually work projects within the materials what we have. We live and work in Airstream trailers that we have recycled. CP: What do you like about Airstream Trailers? KP: They last for one thing. We’ve lived in one for 25 years. We like them gutted so you can put whatever you want in it. We use one as our main living space and then we we each have one to use as a studio. Recycle is a big theme, it’s the right thing to do. CP: I know you play the fiddle, guitar, and love to sing. I’ve enjoyed many jams with you. What do you like about old time music? 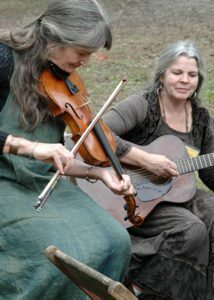 Kay Patterson & Peggy Patrick play a tune together at Fall Festival. KP: I love the form so much. It is so relaxed. It’s usually played with friends and the tunes are so universal. People usually know these tunes all over the country. It’s community music more than performance music. People accept you at your level and that’s really great. I probably would have never learned to play if I had never moved here because the area is so rich in music and singing; it’s all about the connection for me. I am a shy person who doesn’t drink, so going to a party and talking is not something I want to do all night, but I can play music for hours. Music is my favorite way to be social. CP: Which music classes have you taken? Well, as you know (because you were in the class), I took Old Time Jam Camp with Michael Ismerio and Ben Nelson. I’ve taken fiddle classes with David Kaynor, Bruce Molsky, and Brad Leftwich. I’m looking forward to the intermediate/advanced fiddle class in January with Erynn Marshall and Carl Jones. I took a guitar class with Jim Lloyd and he is a fantastic storyteller. I also took Annie’s Fain’s banjo class and even though I did stick with it, she’s a great teacher. CP: What’s it like being a famous craft couple of the Folk School? KP: Well I don’t know. I don’t feel that original after Kay and Tom Benham started teaching jewelry at the Folk School. They are really good instructors. CP: You should challenge them to a tennis match! Well, you are a very beloved craft couple. Folks often talk about how much they love you. KP: Well we love you and the Folk School too. See below for a list of current class offerings with Kay Patterson. You can also find Tom and Kay at the Folk School’s annual Fireside Sale coming up on Sunday December 4, 2016. Stop by their booth in the Community Room and check out their fine-crafted wares in a variety of materials. Make a pair of cozy, custom-fit felt shoes or boots. Use wet-feltmaking techniques to construct colorful uppers, and then discover how to attach a durable, wearable sole. You may add embellishments to your felt through beading, appliqué, or needle felting. Expect to complete at least one pair of shoes or boots in class. All levels welcome, but feltmaking experience is helpful, and hand strength and stamina are needed. Note: Additional materials fee is estimated at $100 per pair. Register today! Learn some fun ways to form your own shapes from copper sheet. These will be the canvases onto which you’ll enamel. We’ll explore several techniques for applying colorful enamels (powdered glass) and firing, including some exciting and fast two-minute firings. It’s so addictive to try different combinations and marvel at the results! All levels welcome. Register today! Discover how to use a barbed felting needle to transform colorful, carded wool into an amusing character doll. Cut loose your imagination to create your own original figure. This is low-tech fun, easily replicated at home with nothing required but needles and wool. Students of all levels are welcome to join us for a merry weekend of needling around! Register today! 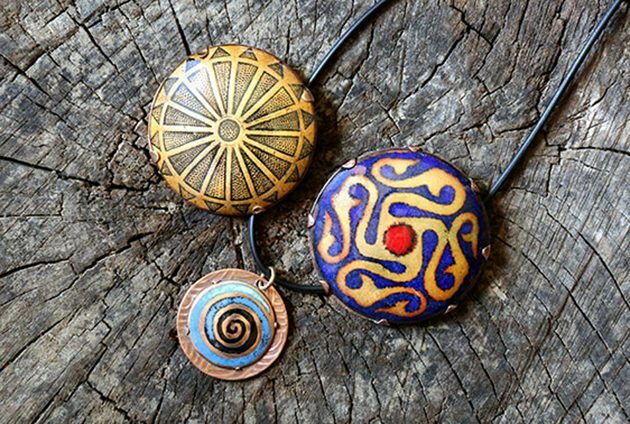 Make beautiful 1″ to 2″ enamel pieces, suitable for pins and pendants, using techniques practiced for centuries. Begin by drawing or transferring designs onto copper and etching out the area behind the design. Varying the depth of the etch will produce different intensities of color seen through an overcoat of transparent enamels (basse-taille). Solid-color opaque enamel can be wet-packed into deeper recesses, with some copper design exposed (champlevé). All levels welcome. Scandinavian Heritage Week honors the Folk School’s roots, inspired by “folkehøjskole” of these northern European countries. In the company of newfound friends, you will enjoy special food, music, dance, and craft traditional to the region. Register today! 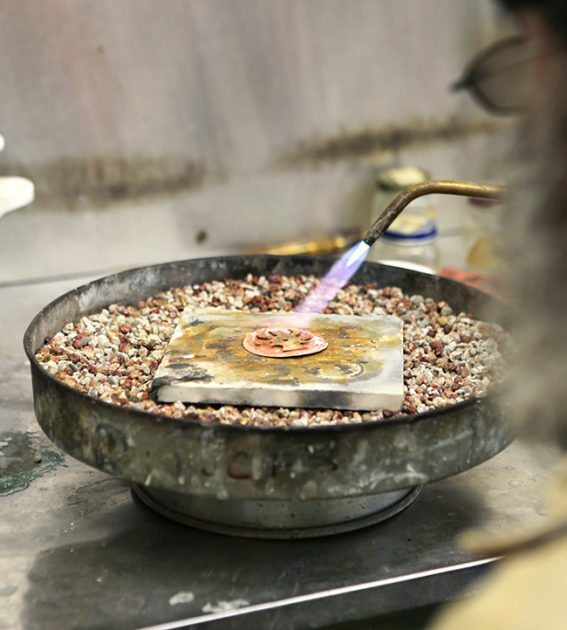 Learn traditional jewelry/metalsmithing skills with a strong emphasis on the use of recycled and repurposed materials to make exciting new jewelry pieces. 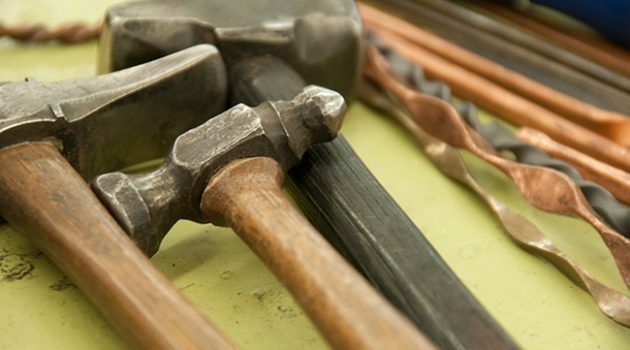 Receive a thorough grounding in the proper use of the basic tools of the trade. Areas to be covered include fabrication, forging, hot and cold connections, and foraging for raw materials. While this class is designed for beginners, experienced jewelers may enjoy a fresh perspective on materials. Register today! 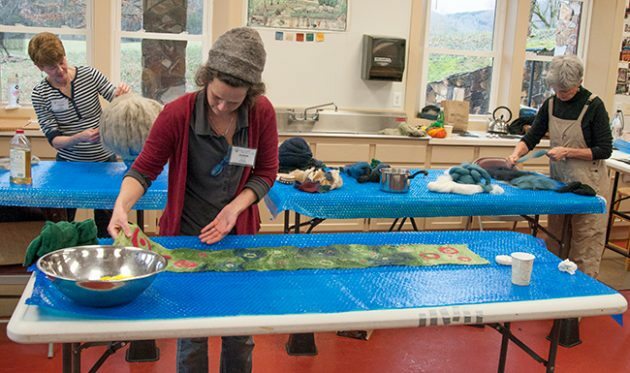 Practice different methods of making felt to discover how versatile wool can be. Wet-felt around a resist to make hats, bags, slippers, and/or vessels. Incorporate silk into wool to make nuno felt scarves or fabric of amazing texture. Later in the week, use carded wool and felting needles to embellish your felt and even sculpt a figure. Students of all levels, join us for a physically active, creative week. Register today!